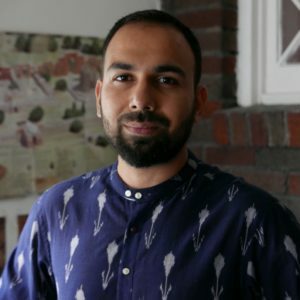 The Joseph W. Elder Prize in the Indian Social Sciences was awarded to Anand Taneja, an assistant professor in the Department of Religious Studies at Vanderbilt University, for Jinnealogy: Time, Islam, and Ecological Thought in the Medieval Ruins of Delhi. Jinnealogy: Time, Islam, and Ecological Thought in the Medieval Ruins of Delhi, which has been offered a contract with Stanford University Press, centers on Firoz Shah Kotla, a ruined medieval palace which has become a prominent dargah, or Muslim saint shrine, in contemporary Delhi. Built circa 1354 and long fallen into disrepair, the widespread popularity of Firoz Shah Kotla as a dargah began in 1977. Firoz Shah Kotla is frequented by both Hindus and Muslims, and the saints venerated at this dargah are not human, but Islamic spirits known as jinn. Visitors write letters of petition to these jinn-saints as if petitioning a government official, including their name, address, and passport photos in their appeals. They deposit multiple copies of these letters in various niches and alcoves through the ruins. Firoz Shah Kotla is also a place where animal life flourishes, especially cats, snakes, and kites. As the jinn are shape-shifters in Islamic mythology, often taking the form of animals, these animals are imbued with sacrality in this space. Situated in the heart of the bustling capital of the largest democracy in the world, Firoz Shah Kotla casts new light on the relation of theology to post-colonial politics, the ethical potentialities that popular Islam holds open for Muslims and non-Muslims, and the relation of the ecological to urban sacrality. At a time when reformist Islam is dismissive of the jinn and the realm of the unseen, following the familiar script of modernity and disenchantment, here we see the jinn being sanctified. In this book, I show that the enchanted nature of popular Islam that we encounter here is not a pre-modern relic, but an ethical, political, and theological stance emerging anew in response to the post-colonial condition. The book consists of an introduction, an afterword, and seven chapters, divided into three interlinked sections. The first two chapters are concerned with temporality: the ways in which the veneration of jinns and saints amongst medieval ruins bring memories of the pre-colonial past into the post-colonial present, and hold open alternate temporalities and political theologies. The middle three chapters are concerned with Islam: they analyze the Islamic ethics encountered at Firoz Shah Kotla and look at the forms of translation through which these ethics have become part of the shared moral world of urban North India, across religious identities. The last two chapters explore the sacred landscape of pre-modern Delhi, and its links to the city’s ecology, examining the ways in which colonial and post-colonial development has radically reshaped this landscape, and replaced it with new forms of legal enchantment. Anand Vivek Taneja was born in Bangkok, and grew up in Lucknow and Kochi. He studied at Delhi University, Jamia Millia Islamia, and at Columbia University, where he received his PhD in Anthropology in 2013. His research and teaching interests include urban ecologies, enchantment and ethics, animality, historical and contemporary Islam and inter-faith relations in South Asia, post-colonial urbanism, Urdu literature, and Bombay cinema. His peer-reviewed articles have been published in the Indian Economic and Social History Review, HAU: Journal of Ethnographic Theory, and Comparative Studies of South Asia, Africa and the Middle East (CSSAAME). He has also published popular essays on urban life, historical amnesia, and alternative forms of remembrance in The Book Review, Time Out Delhi, The Indian Quarterly, and on the websites Kafila.org and Chapati Mystery. In 2015, he co-edited a volume on the theme of “Animals, Ethics, and Enchantment in South Asia” for CSSAAME. He is currently beginning a project on religion, infrastructure, and shifting ontologies in urban North India.